Toupées are a type of wig that is generally meant to provide only partial coverage, usually for men experiencing some form of hair loss. Before purchasing a hairpiece, however, it is essential to learn about the different types available and how to care for them in order to find the best possible style and fit. Toupées are very similar to full head wigs. For years, jokes and comedy routines frequently targeted the hairpieces because early designs were patently fake and very obvious even to a casual observer. Because of this stigma, many partial hairpieces today are called units, hair systems, or a type of hair extension, though they all serve the same purpose. The foundation of a hairpiece is the base or cap that will be in contact with the wearer's head. The materials vary as well as the amount of ventilation, and most men choose a model that works well for their general level of activity. Hair, whether synthetic or real human strands, is then attached to the foundation either by machine or by hand. A basic hair style may be created during construction, or there may be more flexibility available for changing styles. Men's hairpieces are available in a range of colors and lengths to suit all individual preferences. The diameter of the base may also vary to accommodate different balding patterns, though if the hair loss is hereditary (as most male baldness is), it may be wise to purchase a toupee slightly larger than currently necessary to allow for longer use. Many men become disheartened as they lose their hair, and they investigate different restoration options, including transplants and a variety of hair loss products. A toupée may be a better choice if the hair loss is minimal, and it can be used in conjunction with different products and treatments while hair is being restored. On the other hand, if the baldness is permanent and may increase over time, it may be best to forgo a hairpiece and accept the loss gracefully rather than become involved in expensive wig options. Because most toupées are worn by men who still have some hair - either trimmed very short beneath the hairpiece or outside the bald patches - they often come with clips to attach to the remaining hair for a secure fit. Unlike full head wigs that may have adjustable straps or elastic for security, a partial hairpiece is often too small to attach this way. Double-sided tape is available in assorted widths and is formulated to attach to both the hairpiece and the scalp for a firm grip without irritating sensitive skin. At Hair Direct, individuals are able to design a hair replacement system that is customized to their balding pattern. All the measuring is done in the privacy of your own home using the tools in their custom fit kit, and you can order with confidence because the products are backed by a 100 percent money-back guarantee. Hair Replacement Center, Inc., has a wide variety of men's hair systems and hair pieces from which to choose. They ship worldwide and will customize a toupée to your specifications. Headcovers Unlimited offers a nice selection of men's toupées and accessory items like toupée clips at affordable prices. Today's hairpieces for men are better fitting and easier to wear than the obvious models of the past, but they must be meticulously cared for to keep their shape and appearance. Most toupées can be worn during sporting activities and even while swimming, but wearers should note that such vigorous activities will wear the hairpiece out more quickly and may even cause permanent damage. The hairpiece should be gently washed every one to two weeks depending on the amount of sweat and dirt that accumulates. The best shampoos and conditioners to use are those specially made for wigs, and heavy chemicals should be avoided. When not being worn, the hairpiece should be stored on a mannequin to help keep its shape and style. What many men fail to realize is that baldness can be a sign of sophistication and maturity, attributes that many women find admirable and attractive -- whether you are middle-aged or into your senior years. 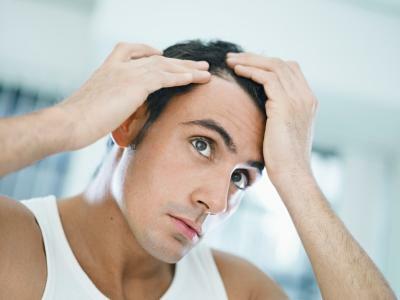 Though it may be difficult to adjust, many men ultimately find it easier to accept their hair loss without intervention, though if the loss is patchy or uneven a toupée can help ease the transition.